I started smoking cigars in the early 90's when the cigar craze just started. I would buy one or two at a time, smoke one with friends and I even joined a cigar bar. A Twenty dollar membership and you got to enter the back room where jazz music from John Coltrane met you in a blue cloud of cigar smoke and a purty girl tending bar and would dress your cigar dipped in brandy. My friends and I thought we were big shots. I admit it was fun. We even met a few "stars" if you can call them that (90's rock band Candlebox). I never minded spending upwards of $10 on a nice puro. Ten bucks was a lot of money for a starving Scuba instructor at the time. Well, the cigar bar closed and the craze died down due to an influx of cigar makers taking advantage of poor scuba instructors. Over the years I continued to enjoy a stogie now and then, and even bought a humidor to keep my puro's longer. I will try and bring to light a few of the smokes I enjoy. Todays entrant is Leprechaun. I have found the lack of time to be a major problem when the desire to smoke a cigar is in order. When time is not on your side I turn to the cigarello. Many cigarello's fall into the flavor infused category. Cherry, Rum, Vanilla, Honey Nut, etc...While they may taste nice to some, to me it just isn't the same as a classic cigar tobacco. This is where cigar companys like Leprechaun take the stage. For years the Dutch have owned the market on cigarellos in Europe, now countires like Ireland are joining the cigar market and producing wonderful bold cigar tastes packed in a 3 5/8" 23 ring guage puro. 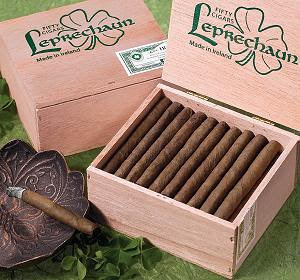 Give them a try when you seek the taste of a cigar but just dont have the time for a full size.